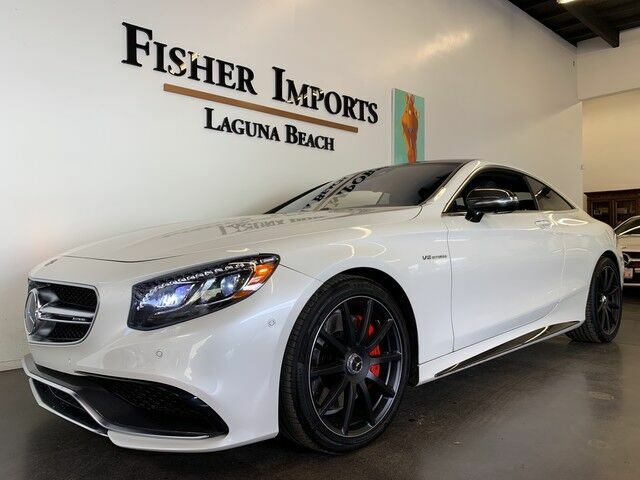 YOU ARE VIEWING AN ABSOLUTELY IMMACULATE 2016 MERCEDES BENZ S63 AMG DESIGNO COUPE! -HUGE ORIGINAL MSRP OF $197,720 !!! 2 OWNER CAR !!! LOADED WITH OPTIONS INCLUDING: BURMESTER 3D SURROUND SOUND HIGH END SYSTEM !!! MAGIC SKY !!! SWAROVSKI CRYSTAL HEADLIGHTS !!! NIGHT VIEW ASSIST PLUS !!! DESIGNO EXCLUSIVE NAPPA LEATHER !!! DESIGNO DIAMOND WHITE METALLIC !!! RED PAINTED AMG BRAKE CALIPERS !!! REFRIGERATOR IN REAR CONSOLE !!! WARMTH AND COMFORT PACKAGE !!! DISCTRONIC PLUS !!! HEATED WINDSHIELD !!! CARBON FIBER ENGINE COVER !!! CARBON FIBER REAR VIEW MIRRORS !!! CARBON FIBER FRONT SPLITTER !!! CARBON FIBER REAR DIFFUSER !!! CARBON FIBER ROCKER PANELS !!! DRIVERS ASSISTANCE PACKAGE !!! HEATED STEERING WHEEL !!! HEATED AND COOLED FRONT AND SEATS !!! DYNAMICA HEADLINER !!! HEADS UP DISPLAY !!! SPLIT VIEW DVD !!! Please contact Fisher Imports at 949-715-8988. We are happy to assist with the arrangement of transport! Finance options available!